At 26.8 cu. ft., this LG French Door Refrigerator gives you plenty of extra space. The slim Space Plus ice system provides ice while freeing up even more room in the door, and with French doors, it's easy to get food in or out. Premium LED lighting provides bright illumination to find your favorite foods, while the tall ice and water dispenser measures 12.6 in. to accommodate many sports bottles and pitchers. This refrigerator's linear compressor uses fewer moving parts while operating efficiently, and LG confidently backs the motor with a 10-year warranty for added peace of mind. are the sides of the stainless steel refrigerators also stainless? No, gray material on side...metalic...magnets will stick!! Is the water that comes out of the dispenser chilled? We live in Texas so the water from the tap is warm in the summer. Will the water be chilled coming out of the filter? The water is chilled until the basin runs out, then the water is hot. &quot;10 Year Warranty Linear Compressor&quot; sticker - Can this be removed? I saw this question posted earlier but I am having trouble removing this sticker. I just called LG's Customer Service number and was told they do not recommend removing it because it can make the fridge look &quot;ugly.&quot; Any advice on how to remove the sticker without damaging the door? It seems to be a foil/metal sticker and doesn't want to peel off. Thanks! So appreciate all of your advice! I couldn't even get my finger nail under our sticker. Plugged in the hair dryer, heated it up for about 20 seconds and it peeled off in one try - completely clean! Thank you! Does the LFX28968ST make ice cubes? They are not listed on the comparison table. If it does make cubes and not just crushed ice,, are they dispensed through the door? Yes - we have lots of ice. Love it! 26.8 cu. 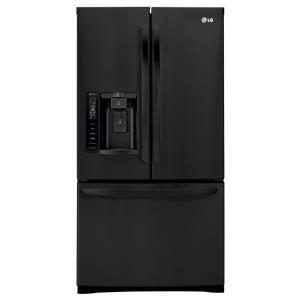 ft. 3 Door French Door Refrigerator in Smooth Black is rated 4.3 out of 5 by 967. Rated 1 out of 5 by vince from LG Life Gets…NOISY Hours after the refrigerator was delivered it started to emit a very high pitched sound from the compressor. We had an LG rep come out to examine and before doing anything he said it was not defective but that the noise was due to improper installation on an uneven floor. Even after leveling it on both top and sides it still does the same thing; by the way the floor is perfectly level in front of and on the side of unitl. Additionally, if you take your finger and press against the doors or side it will temporarily stop the noise. It is so piercing you can hear it in all contiguous rooms within your home; it’s as if your ears are constantly ringing. LG list the noise as a problem under the troubleshooting section of the owner’s manual and then explains that it is normal due to the designed efficiencies they built in. Due to this design the unit runs longer so you get to enjoy this annoying sound even more. I wouldn't walk… I would run from this LG. Rated 2 out of 5 by JDCrony from Nice quiet refrigerator with lots of room. But does have a weak point. Have had this refrigerator for a couple of years now. Purchased it at the end of November 2013. I was concerned when purchasing about the lightness of the door bins and all the drawers. The gauge of the plastic seemed thin compared to my last unit. But figured LG makes quality products and they must know what they are doing. Problem is, the door bins break very easily between the clear / with plastic part. I now have 3 bins I have to replace for the same exact problem. I suppose I could epoxy these bins back together, but I hate the idea of doing so on $2700.00 refrigerator. It would look very unsightly still pretty new refrigerator. LG will not replace them, and my 5 year home depot extended warranty will not cover it as well. My last refrigerator had milk door bins, etc. And lasted the whole 15 years I owned the unit. Would not recommend buying this refrigerator unless you are ready to replace these bins at $30 a pop from time to time. Rated 3 out of 5 by rl from Nice fridge, but defective ice dispenser design The basic fridge itself is very good. Its got lots of space, and food stays in good shape much longer than our previous fridge -- though I do not know why that should be. It is pretty quiet. My main complain would be about quality. The first fridge we received did not work at all. Home Depot was great and quickly arranged a replacement for us. The ice dispenser on this does not work much. Having the ice dispenser makes a whole lot of space available in the fridge -- which we love. But whatever they have designed creates lumps of ice in the ice maker that the dispenser cannot deal with. So what we have to do is periodically take the ice out of the ice maker, and move the ice to a tray in the freezer. That's a disappointment in a fridge in this price range. Everything else, now that we have had it for a few months, is great so far. I would not recommend the product. I think you are better off getting a model without the ice dispenser, and saving the money for a non-functional feature. Rated 5 out of 5 by Charley121707 from Quality with a lot of storage. Easy open handle on the freezer is a must for anyone who has struggled with a vacuum sealed door. The freezer was our biggest worry when we purchased. We have always had a side by side or top freezer. We have not found any concerns after we used the freezer. Has a lot of storage and easy to get to. The pull out drawer helps a lot with organizing. Ice maker is quite and will generate enough ice. We have not had any trouble with ice freezing together, however we use a lot of ice everyday. Handle is a little hard to open. We transfer the cubes to storage in the lower freezer and use the dispenser for crushed. We like the reminder beeps if the doors are left open too long even though we do not have children at home any longer, we still forget to close the doors sometimes. Refrigerator storage and lay out is great. We can adjust the shelves to meet our needs. We especially like the trays on the ice maker door for storage of smaller thin items. We like that no space is wasted. 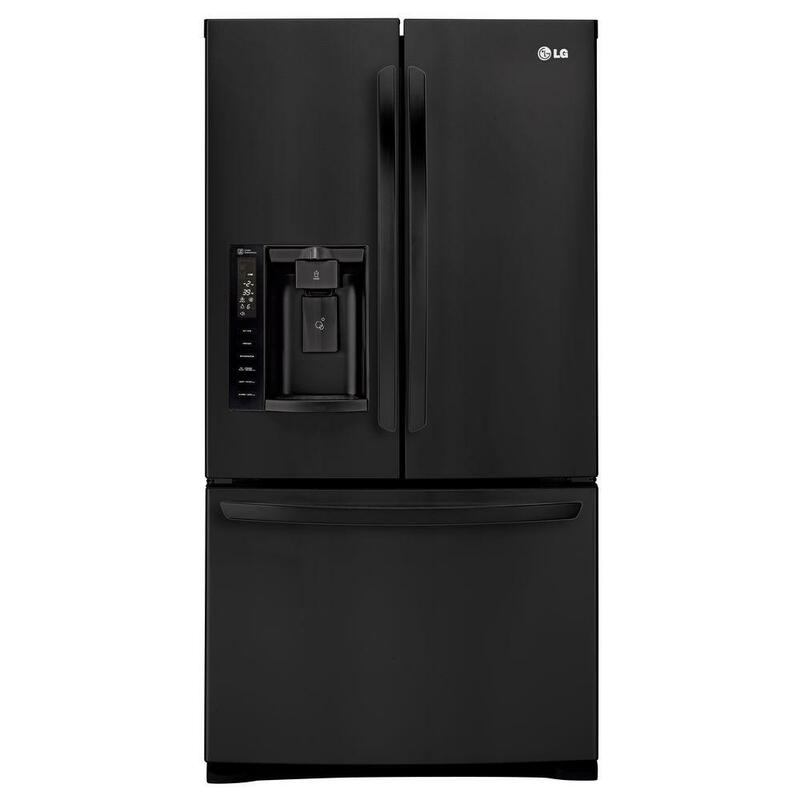 Rated 3 out of 5 by KDoug4181 from I love my LG However, it is only 3.5 years old and now needs a compressor. The freon is leaking. Lovely. Rated 1 out of 5 by Wimco from Avoid purchasing thisrefrigerator at all costs Product has failed 3 times over 3 years. I have an extended warranty on the refrigerator but losing $1,200 of food far exceeds the warranty value. The LG customer service center runs a diagnostic through you holding your cell phone up to the speaker on the left inside door of the refrigerator. The LG customer service computers send a series of signals over your cell phone to run a diagnostics to determine the problem with the unit. The results are the same every time; "we need to send out a repairman". The diagnostic process is a gimmick in my opinion. In a two paycheck family, one of us has to take time from work to wait for the refrigerator repairman. There was a class action suit on this unit in 2014. We were asked to submit repair statements and estimate value of losses (food). My claim was denied because we didn't have the itemized receipts for losses being claimed. Who keeps 6 months of grocery store receipts? A very frustrating, time consuming and expensive experience. Based on my experience, I will never purchase another LG product again.